Right now, we’re in the middle of the holiday gift giving season. Giving gifts can be a great way to express our love for each other, and I’m all for sharing and expressing love. But these days a lot of people have all the stuff they need. At family gatherings, I’ve seen huge piles of gifts, and I wonder how many of them are still in regular use at the end of one year. I’ve always had a personal interest in this topic. I’m continually distressed by the rampant commercialism and materialism that I see at this time of year, and I avoid any kind of a retail establishment from November through the end of January. When I was in high school, a friend got me a gift for my birthday that was just completely out of touch with who I am and what I like. I felt like anyone who knew me, even a little bit, they would know that this was not a good gift for me. When she gave it to me, she said “I didn’t know what to get you, so I just got you this.” I concluded that the only reason she got me this gift was that she felt obligated to because it was my birthday. After that, I didn’t want anyone to feel obligated to give me a gift ever again, so all through college, I wouldn’t tell anyone when my birthday was. It was actually kind of neurotic. My friends would try to steal my wallet so they could look at my drivers license to find out my birthday. I said, “I don’t want people to feel obligated to get me a gift, and if someone wants to give me a gift, they shouldn’t need an excuse like my birthday to do it. Why don’t we share our gifts with each other all the time?” Fortunately, I’ve become more relaxed in my old age. My friend Gary from college was astonished to find that I put my birthday in my Facebook profile. Did you know that one out of five people already say they plan to return gifts they will receive this holiday season. They know that even before they’ve received them. Furthermore, when holiday shoppers are surveyed, many of them say they’re shopping for themselves rather than buying gifts for others. In fact, a survey of women in the UK indicated that 50% of them spend more on themselves than for everyone else on their list combined. Have you ever received a gift that you don’t like but you feel obligated to keep it, store it, and bring it out when the gift giver visits, just because it was a gift? I’ve talked about this more in podcasts “9. Simplifying Gifts,” and “6. The Hidden Cost of Stuff,” but I have seen in my experience that there are times when stuff given as gifts can actually become an imposition to the receiver. I asked my dad what he wanted for Christmas, and he said “if I don’t have it, you can’t afford it!” And I’m sure he’s right. So what do you get for the person who has everything? My suggestion is to not get them stuff, and in this podcast I’ll suggest other gifts you can give to show your love to others without cluttering up their lives. Clutter free gifts fall into three major categories: time, experiences, and services. I’ll also talk about another category of gifts that, while not exactly clutter-free, is clutter limited, because it creates temporary clutter only. Let’s start with time. Our time is the most valuable asset we have. I believe the most valuable the gift we can give to someone, as well is a very powerful way to share our love, is to share our time. That could be as simple as spending time with someone, sharing in activity, taking them out to dinner, going on a hike, or calling them on the phone. Sometimes visiting a loved one for the holidays can be the most appreciated gift you could give them. The second category for clutter free gifts is experiences. Many, many studies over the past decade have shown that experiences lead to a greater increase in happiness than the same amount of money spent on stuff. The same would apply to gifts. Experiences can be as simple as a gift certificate to a movie, to dinner out at a restaurant, or a massage. Last year my sister and I joined together and got our parents I gift certificate that could be used at any of hundreds of different bed and breakfasts throughout the country. My beloved and I took her nieces horse back riding. Near where we live, there’s a place called iFly, which is actually a vertical wind tunnel where people can experience the sensation of skydiving in a safe, controlled environment. I’ve always thought this would be a great gift for the adventurer on the list. This would be an experience someone couldn’t get from a video game. Another idea is to make a donation to a charity in that person’s name. I’m including this in the experience category, because they get the experience doing good in the world and helping those less fortunate. There are many, many different charities that support a huge number of great causes. A type of charitable giving that I’ve become interested in lately is micro-finance. Tiny loans, some as low as $100 can give people, mostly women, in Third World countries the ability to start a business, to become economically self-sufficient, to provide for their families, and even to provide work for others. A great place to get more information is www.microfinancegateway.org. The third category for clutter free gifts is services. The gift of services can be very meaningful and appreciated, especially when the service is something the receiver is not able to do themselves. The gift can be any service that you’re capable of. I used to be a tour guide, and last year we offered my sister and brother-in-law a customized, private tour of San Francisco. I have also offered the gift of organizing services, but the gift could also be trimming a hedge, offering a night of babysitting to allow the parents to have a special night out, private instruction in how to use a computer, shoveling snow, etc. If you’re not able to provide the service yourself, you can also get a gift certificate so that the service can be provided by someone else. There is another category of gifts that, while not exactly clutter-free, create only temporary clutter, because the gift is actually used up in the process of enjoying it. For example, every fall my parents make homemade apple butter and apple cider and give that as gifts. Other examples would include homemade cookies, chocolate, wine, fruit baskets, flowers, gourmet cheese, anything that will give the recipient pleasure but not result in a permanent contribution to their clutter, having to be cleaned, moved, or disposed of at a later time. So there you have three categories of clutter free gifts, time, experiences, and services, and a category of temporary clutter gifts, which you might also call consumables. Until next time, may you have a happy, joyous, connected, and clutter-free holiday season. Note: if you listen to the podcast version of this post, you will be treated to the original song “Too Much Stuff,” sung and composed by Donnalou Stevens. In the last post, we began a sample project of organizing a garage. We were not able to finish it all at one time, so today we come back to the project and complete it. Let’s do a quick review of what happened in the last session. I divided the project into four stages: preparation, setup, implementation, and follow-through. In the preparation stage, we made sure we were emotionally and mentally prepared for organizing by getting in touch with our goals. We considered both our goals for this specific project and for our life in general. We also made sure we had any supplies we needed. In this example, I’m showing how an organizing project can be done with minimal investment and overhead. At this point, the only supplies you really need are empty cardboard boxes. Many people already have empty boxes (or other containers) in the garage. If this is the case, you can make use of these boxes as sorting containers. This helps the organizing process in two ways at the same time. First, it creates locations for categories of stuff, and second, it creates space by freeing up space consumed by the unused boxes. It’s a win-win. In the last session, you also had a box labeled “Go Elsewhere.” That same box can be used as part of your infrastructure again today. Another useful container that I forgot last time is to have a plastic bag to collect all the empty plastic bags that you encounter. These plastic bags can then be recycled at your local supermarket. And finally, the last part of reestablishing the infrastructure is to re-open any sorting containers that were not full at the end of the last session. After the infrastructure is again complete, you are now ready to move on to the third stage: implementation. Implementation is where you follow the Three S’s of Organizing. As I’m sure you remember, the three S’s are Simplify, Sort, and Store. Simplifying is deciding whether you want something to stay or go. Sorting is choosing a category for it. The last time, we were in the midst of sorting and simplifying and we were doing them both at the same time. So that’s where we will pick up today. Continue going through any unsorted stuff, item by item, separating it all into the categories you’ve created. If you encounter an item that belongs in a category you haven’t encountered before, create a new container with an appropriate label for that new category. Make sure you don’t pick something up, look at it, and then put it down. If you do that you’ve invested time and energy in that item, yet you haven’t made any progress. For every item, put it with the category. If no category exists, create one. Remember that, as you go through stuff, your goal is to get to the bottom. As an example, let’s look more closely at a specific part of the project. Suppose a cabinet in the garage has a drawer. Take a look at the contents of this drawer. If it’s already organized, put a label on it that says what’s in it. If it’s not, go through the drawer sorting all the stuff in it into categories. Don’t stop until the drawer is completely empty. After the drawer is empty, clean it, if necessary. Now find one or more categories of stuff that will fit and put these categories in the drawer. What you’ve done is replace unsorted stuff with categories of sorted stuff. Previously, this drawer was a conglomeration of a bunch of different miscellaneous items so that you really didn’t know what was in it. Now, it contains a few specific categories, and you know that anything in these categories is in that drawer. Make a label for the drawer. We can’t guarantee that this will be the permanent location for these categories, so use a temporary label. Post-it notes work great as temporary labels. Write the categories on a Post-it note and stick it on the front of the drawer. By now, it’s likely that you’ve emptied drawers, shelves, cabinets, or other storage spaces that are present in the garage. Any time a space is emptied, it can then be used, in addition to the boxes, to hold categories. After you’ve gone through all the stuff in the garage simplifying and sorting into categories, it’s then time to move on to the third S, storing. This is the process of deciding where in the garage each of the categories will live. It’s the process of matching categories of stuff with storage spaces. If you’ll remember from “The Third S: Store,” you want to assign storage spaces based on three criteria. First, you want stuff you use most often to be most accessible. Second, you want the size of the category to roughly match the size of the storage space. And third, you want stuff to be located near where it will be used. This may seem like a lot to consider, but when you actually do it, you’ll find that it’s more straightforward than you might think. Two of these factors, the first and the third, are concerned with usage and the other is concerned with size. Many garages are used predominantly for storage, and if this is the case, the factors related to usage are less important. It’s a different situation if the garage is used as a workshop or an art studio. For the sake of keeping things simple, I will assume that the garage in our example is used for storage only. In other words, stuff is stored in the garage but it is not actually used there. Therefore, the factors concerned with usage are less important and we will focus on matching the size of the category with the size of the storage space. In any case, the process we will follow will still work even when the other factors are considered as well. Here’s a good way to go about deciding where to store your sorted categories. First, get pencil and paper and something that will allow you to move around the garage and write, like a clipboard. On the piece of paper, create two columns. At the top of the left column, write “Categories” as a heading. At the top of the right column, write “Storage Spaces” as a heading. In the left column, make a list of all of the categories you’ve created for all the stuff you’re going to keep. In the right column, make a list of all the places in the garage that are available to put things. This would include cabinets, shelves, drawers, closets, storage bins, and any other available spaces that could become a home for a category. Then, draw lines from each category to a storage place where it might be contained. I guarantee you this will not be the final place each of these categories will be stored. This is because you can never know for sure just by looking how well a category will fit into a storage space. This is just a way to formulate a high-level strategy. That strategy can then be modified as necessary when you physically place the categories into the spaces and see how they fit. Because you will be moving categories around, you’ll find it’s useful to containerize as much as possible. Using containers makes it easy to store and to move categories from one location to another. If you have all your batteries in a container, it’s much easier to move the container to a new location than it would be to move a whole bunch of loose batteries. You’re now ready to physically put a category into a storage space and see how well it fits. If it fits well, then leave the category there and move onto the next category. Ideally, it won’t fit too tightly. It’s nice to have some extra space to be able to expand into. Plus, if a space is jammed tightly, it will be really difficult to access the contents. If the category doesn’t fit well in the storage space, there are three different ways you might respond, by relocating the category, by changing the size of the storage space, or by changing the size of the category. The first option is to remove the category from the space and find another location where it will fit better. Remember that if you are sufficiently containerized, it will be really easy to move things around and adjust any time you see a way that a storage location can be improved. The second option is that it may be possible to adjust the size of the storage space. It may be possible to raise or lower shelves to better accommodate the size of the contents. It may be possible to use a drawer divider or other containers to split a large space into smaller ones. The third option is that it may be possible to modify the size of the category. You can make a category smaller by simplifying, if you decide that there are some items that you really don’t need after all, so you are comfortable letting them go. You can also make a category smaller by subdividing. For example, if your “Art Supplies” category is too big, it may help to break it up into the smaller subcategories of “Scrap Booking Supplies” and “Painting Supplies.” You can make a category larger by combining it with another category. If you do this, containerize the two categories so they don’t get mixed up. Examples of containers that might be used to separate the categories include a drawer divider, Ziploc bags, plastic bins, or a container of some other kind. For example, boxes or plastic storage bins can be stacked inside a cabinet. Continue storing by placing each category, one by one, into a proposed location and adjusting if necessary. Continue until you have either run out of categories or run out of space. If you run out of categories and have empty space left over, that’s great. It’s fine to leave empty space. This gives you spaciousness and room to expand into. If you don’t have enough space for all the categories, then you can either let go of some more stuff or find a way to create more space. You can create more space by renting a storage unit, although I recommend against it. You can acquire additional cabinets or sheds if you have room, or you can install shelving units. Different types of hooks or racks can enable you to utilize unused areas, like wall or ceiling space. Boxes or plastic storage bins can be stacked to better utilize vertical space. When you’ve found a home for all your categories, then you’ve completed the implementation stage and are now ready to move on to the final stage, follow through. The follow-through stage is similar to the way we wrapped up at the end of the last session. For anything that’s going to go away, including trash, recycling, and stuff to be given away, arrange to physically remove it from the premises as soon as possible. Distribute stuff to “Go Elsewhere” to the appropriate locations in the rest of the house. And finally, step back and take a look at your clean, organized garage. Give yourself a reward for a job well done. 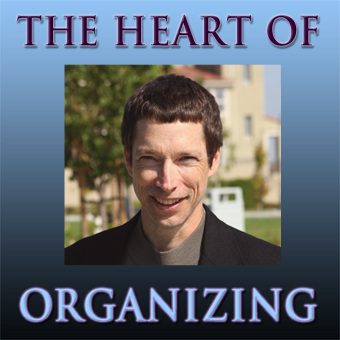 You are currently browsing the The Heart of Organizing: A Blog blog archives for December, 2010.